Everything in this kit is pre cut and ready to sew! Colors are Navy,Red Floral, and White. 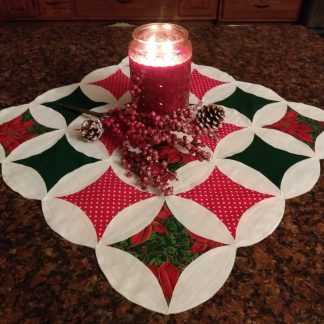 Sewn quilt top will measure approximately 72″ x 84″″. So if you want a bigger quilt either add borders, add sashing between nine patch blocks, or buy another kit. This kit is precision die cut from 100% cotton fabric. This will ensure a perfect fit, plus save you hours of tedious cutting and calculations. Sewing instructions are included. This kit is great for beginner quilters! When using a ¼” seam throughout, each nine patch block, when sewn, will finish at 12” in your quilt. With six blocks in each row across and seven blocks in each column down, the finished size of this quilt of 42 blocks will be approximately 72” x 84”. 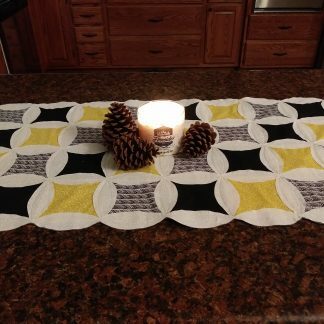 To make a larger quilt, a border can be added, or another Nine Patch Quilt Kit can be combined with this one to make the quilt any size you desire. For a variation, you may wish to choose a Nine Patch Quilt Kit of a different colorway to combine with this one and experiment with the creative color pattern possibilities. *When assembling this kit, you will find a few extra pieces have been included for your convenience. This kit ships directly from our factory, Quilt King Products – Liberty, KY USA.